From the first day I entered the clinic for a CPD day at K9HS, I was hooked. Barbara Houlding has a winning formula in her delivery of veterinary professional training – extensive experience and knowledge, amazing clinical skills and a passion for small animal rehabilitation. 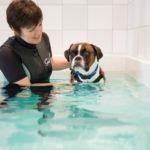 Since that first day, I have returned on a very regular basis, completing one day courses, the ABC Awards Level 3 Certificate in hydrotherapy for small animals and most recently the PG Cert Small Animal Rehabilitation Certificate through Nottingham Vet School, which Barbara was Co Director at the time. 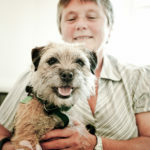 Teaching groups at K9HS are always small, and Barbara endeavours to ensure a diversity of experience within each group. This enables lively discussion and shared experiences. Close attention is paid to each individual’s learning needs, with a variety of presentation styles used. Background knowledge and theory is always applied in a clinical setting and every course candidate has ample opportunity to practise new skills, with hands on support. 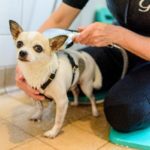 Live dogs and genuine animal patients are used wherever possible, with a wide variety of breeds, clinical conditions and behaviours, so that candidates are able to encounter a broad range of problems within a safe and supportive clinical environment. Whether the training is a one day workshop or a one year course, Barbara ensures that every candidate gains new skills and knowledge at every session, which they can immediately apply in their own work setting to enhance their clinical practice. Training at K9HS has had a massive positive influence of my clinical practice and directly impacted on my animal patients and their families. K9HS always follows up on feedback from course candidates and continually strives to improve the learning environment and experience. Rooms are light, airy and temperature controlled and everyone is friendly and welcoming. I continue to study with and work alongside Barbara. She has been an invaluable help and support, both in my professional development and in my practice, as she is happy to share cases and case discussion openly. We share a common passion for best practice putting our animal patients and owners first.